Diwali, the festival of lights, is a time to celebrate traditions and spend time with family. Lighting diyas, making rangoli and family gatherings add to the festive spirit. The rude sound of crackers and the pollution that is a by-product, is an assault on our senses. 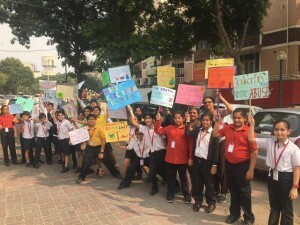 In an attempt to increase awareness about the hazards of bursting crackers, the children of forms III, IV and V took part in a silent march, in the areas around Supermart , the Hamilton court complex and in the school. They carried placards and posters that highlighted the need to celebrate a cracker free Diwali. Wishing everyone a green, environmentally friendly and happy Diwali.